This is a big year for people like me. Although cancer stole Fred Rogers away from this world fifteen years ago, his presence is keenly felt to so many of us. We grew up with him, hearing the gentle words of kindness he bestowed upon every person to whom he spoke, knowing that to at least one man on the planet, we were special. We were loved just as we were. Those of us who were – and, to this day, are – his neighbors have a lot to celebrate. 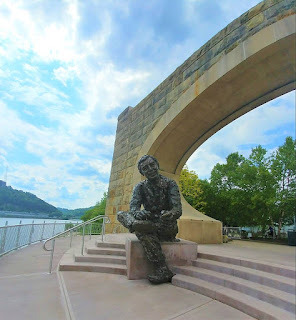 If he were alive right now, Mister Rogers would have turned ninety years old on the first day of spring. His love letter to the world, Mister Rogers’ Neighborhood, turned fifty in February. And with the documentary, Won’t You Be My Neighbor? enchanting theatres right now, excitement is mounting for the biopic in the works currently which will star Tom Hanks. Mister Rogers is certainly getting a lot of well-deserved attention in 2018, gracing an official United States Postal Service stamp, and even being immortalized as a Funko Pop Vinyl figurine, holding his puppet pal King Friday XIII, ruler of the Kingdom of Make Believe. Yes, those of us who treasured Fred Rogers during childhood are being treated to a lot of wonderful mementos of this very special man this year. But this article isn’t about Fred Rogers, the television personality. Indeed, it isn’t even really about Fred Rogers, the man. It is, instead, about a moment this man created that made a huge impact on a small girl he would never meet. There are many articles written about Mister Rogers and his legacy already, and I will leave the facts and the rumors where they lie already. Because the reason Fred Rogers mattered so much – and matters still, today – has little to do with the fact that he was a television icon, or that he is still larger than life to so many people. He took the reins to a medium he hated so much, he felt a compelling need to change it. But that, in itself, is not why we remember him with such clarity and fondness. No, what makes Mister Rogers so important lies in the myriad small, simple ways he reached out to his fellow human beings, taking the hands of his smallest neighbors and giving them most precious of gifts in his gentility, his grace, and the perfect ways he had of expressing the significance of emotional honesty. He taught us all that “feelings are mentionable…and manageable.” He reminded us of all the good we are capable of doing in a world darkened often by greed, selfishness, and cruelty. He made us consider each and every person we met as our neighbor. It is rare to meet someone who felt the effects of Mister Rogers who does not have a story to tell about how, whether they knew him personally or merely watched him on television, there was a moment in time wherein they felt his personal attention focused squarely upon them. There are countless tales from people everywhere about how Mister Rogers seemed to speak to them directly right through the TV screen, helping them to cope with hardships in life, reminding them that they were special, and loved just the way they were. 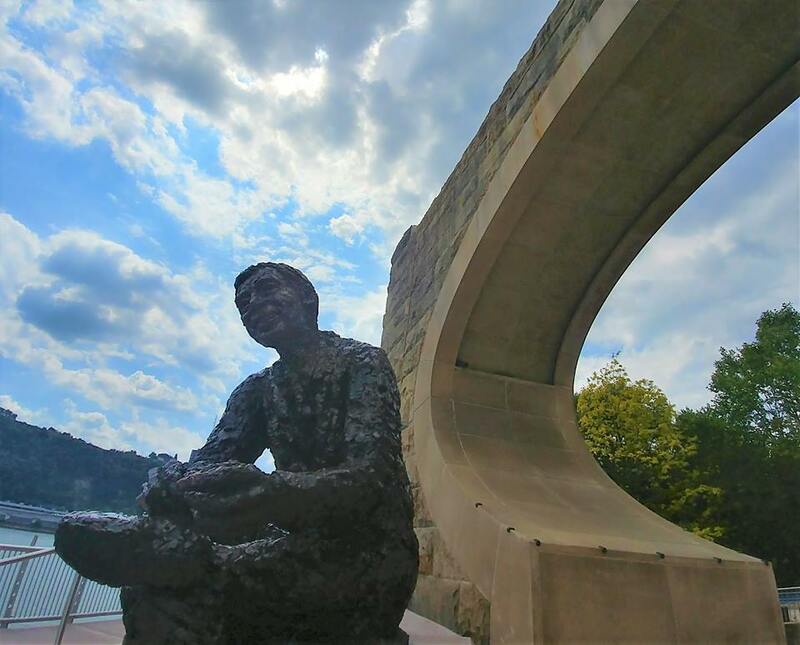 Mister Rogers lives in those stories – stories of the hearts that came to embrace the things he taught, and took deep life lessons from the words he spoke and the beliefs he embodied. When you’re ten years old, life feels really promising. You’re on the verge of becoming almost a teenager, crossing into double-digits; the taste of grown-up sits like a strange, sweet candy, tinged with uncertain notes of sour that you can largely ignore in the sugar rush. You know things are happening, puberty the mysterious shadow of a ghost whose stories with which you haunt yourself when you aren’t paying enough attention to the business at hand – the business of childhood, of laughter, of lost mittens and traded lunches, of secret societies and strange dares. Ten is a time of hanging – keep curling fingers, two at a time, on the monkey bars and see how long you can stay in suspended animation before the pebbled pavement calls your shoes back to it. Too old for so much, not old enough for even more – it is a bridge we cross with bravado, and often, too much gusto. Or so it seemed to me, at the time. I was not a child terribly eager to grow up in many ways; most kids in my class at school would have told me I was too old for the PBS shows I’d grown up with, had they known I still found so much comfort in things I loved when I was really small. My beloved Sesame Street was clearly meant for preschoolers, and Mister Rogers was certainly not a show you’d want too many people in fifth grade to know you still watched, let alone loved, if you didn’t have a little brother or sister at home. As it was, I had few friends and didn’t fit in at all with the “normal” kids – having been born with a condition called Congenital Rubella Syndrome, and being one of only a few children in my private school that needed special tools to adapt within the classroom. My condition, which among other issues I have dealt with my entire life, caused me to be visually impaired after a number of surgeries conducted during infancy to remove cataracts and correct muscles in my eyes. I was not, and am not now, totally blind – but, especially as a child, I needed a lot of help to get through school, with large-print books, magnifying tools, and a seat up front as close to the chalkboard as I could get. It could be pretty embarrassing, being singled out this way and needing so much special attention and so many adaptational tools. It made me stand out, and I already stood out plenty – an imaginative, but socially backward kid who often preferred books to games with other kids. Around the time I was eight or nine, I was beginning to have a great deal of difficulty with my distance vision. Even if sat at the very front of a classroom, the blackboard could be hard for me to see and read, and transparencies on a projector or film strips were just as cumbersome for me. I couldn’t wear contact lenses, so the solution was to give me a new pair of glasses – one with an added feature, in the form of a tiny telescope mounted in each lens, tailored specifically to my prescription, so that I could read signs and blackboards and see faraway things as I needed to. They were strange but oddly fascinating, these new glasses – some of the pairs I’d seen at the low-vision specialist’s had wheels that could zoom in or focus, some had just one longer telescope mounted into a lens instead of one in each. 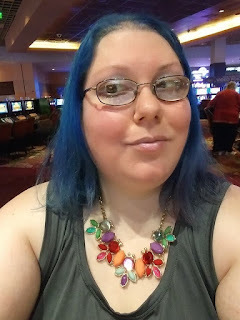 Mine were very simple, just a basic pair of my regular glasses with their thick lenses and crescent bifocals, but with two very small, fixed black telescopes mounted at the top of each side. Each one was focused to my prescription so that I never had to fuss with them. I had nothing against those glasses. I actually loved them – they weren’t like anything I’d ever seen before, and I loved that I could read street signs from car windows and didn’t need to sit with my desk pressed up against the blackboard anymore. I loved how unusual they made me look, the weird ocelli giving me an almost alien appearance. 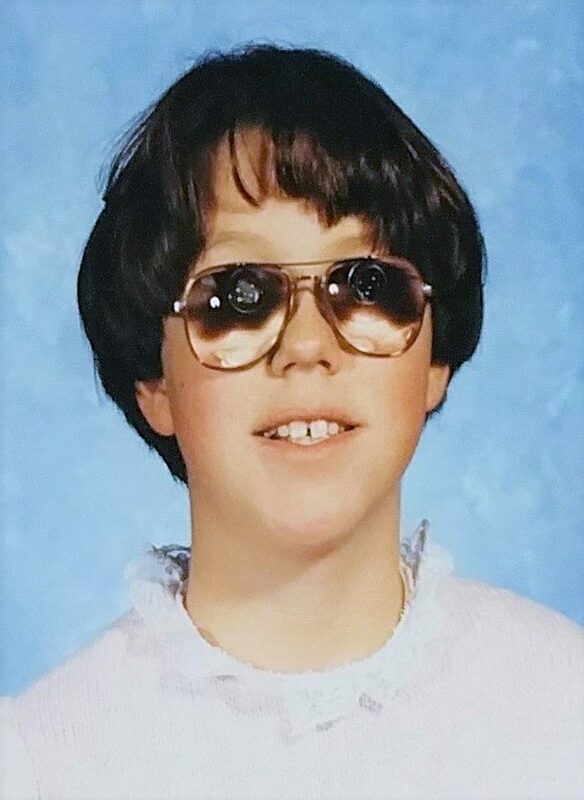 But I was the weird kid, and when you are the weird kid in your fifth grade class, you aren’t allowed to love what’s peculiar about yourself. You must always remember your place, and your place is beneath the scuffed, muddied shoes of those more popular than you. Your shame – the more palpable, the better – feeds the childish rites, quells the hunger of the schoolyard bully brigade. I went to school happy that I was finally going to be able to see faraway things much better, but I was not high enough on the social food chain to let such happiness last. It wasn’t terribly long before the names started. The most common of these was, of course, the ever-so-clever “Bug Eyes”, which was often accompanied by the tiresome wiggling fingers asking how many there were. I tried not to let the small-mindedness of schoolyard insecurities bother me, but I was always a fairly sensitive kid, and after awhile, it started to gnaw at me from the inside. I didn’t have too many people in whom I could confide, and I started to hate the way those glasses were calling attention to my blindness, the apartness I already felt being a handicapped student in such a small school. One day when I had been harassed particularly mercilessly, I came home to my television set hoping to eradicate the anger and loneliness I felt with some mind-numbing cartoon or other. I was flipping channels when I came across Mister Rogers’ Neighborhood. By this age, I was an infrequent viewer and I probably would not have paused to watch the episode, had it not been for a familiar, small wooden case he was holding. It looked exactly like the little wooden case I put my telescope-glasses into at night when I went to bed. Curiosity piqued, I watched as Mister Rogers – a dear old television friend to be sure, but one I’d not really spent much time with recently – carefully removed a pair of glasses from that case. In his methodical, unhurried way, he gingerly displayed them to the camera. And, much like mine, they had telescopes mounted into the lenses. These were slightly larger and longer than the ones on my pair, but they were clearly the same type of eyeglasses I was wearing right at that moment – eyeglasses I’d never seen anyone else wearing out in the world, let alone on television. 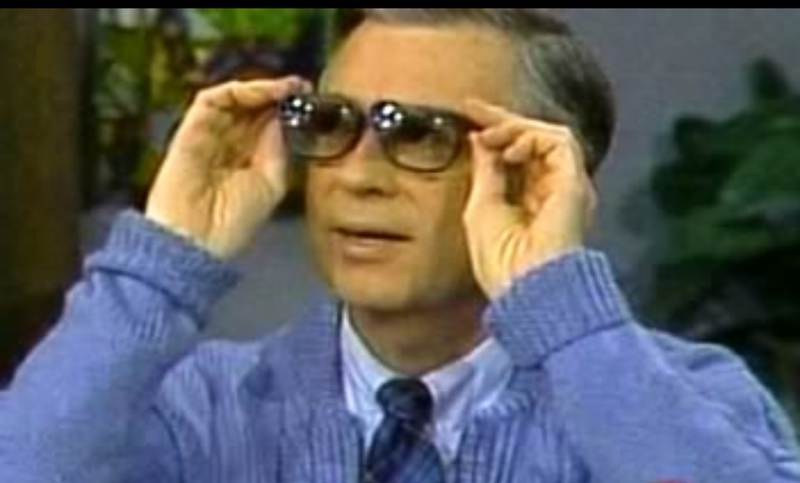 Yet, here was Fred Rogers, trying on this strange pair and talking about how there were many people who might need to wear glasses like these. I was stunned. He went on to talk a little bit about how some people did not see very well, and may need glasses or other tools that might look strange to help them do the things that everyone else did. I don’t remember exactly the words he used, but the gist of his gentle narrative was that, although such people might need to use such tools, which might make them look different or even strange, these people were still deserving of dignity and respect. That, in their own way, they were just like everyone else. That they deserved to be treated kindly. I knew better than to believe that anyone watching from my school would suddenly find themselves watching this same episode, and with a sweeping change of heart decide that I was perhaps not so weird, after all. I didn’t count on any changes out in the real world, beyond the friendly door of Mister Rogers and his patient observations. But, for some reason, the words he spoke at that moment, holding that pair of glasses in his hands and speaking about people who were struggling with the same feelings of insecurity and aloneness I felt during that period of my life, loosed something tight within my heart. I would always feel like an outsider – this I knew, and had come to accept, even at the age of ten. But something was different after I saw that simple scene on television – something I couldn’t define, then, but which has struck me since as a small inner victory. For someone had validated my existence. I was most certainly not as alone as I felt; there were other people out there, even other children, some perhaps even younger than me who were dealing with such difficulties in their lives. They, too, had to wear these telescope eyeglasses, and some of them were likely also being teased about them, made to feel ugly and alien among their peers because of them. At that time in my life, I hadn’t really known any other kids who dealt with the same issues as I did – there were a few that I saw once in awhile, during life skills classes or seminars my parents would take me to about vision impairment and other tools we could use to help me in school and at home. But these weren’t daily playmates, and they certainly didn’t attend my school. I knew that I would still find bullies and unkindness based on my appearance, that nothing had truly changed. But if there were others out there who wore these same glasses, they were probably also dealing with the same problems. They probably felt hurt and isolated, unattractive and peculiar, just as I did. And we would largely have to carry such feelings deep inside us, too ashamed to talk about them and feeling too afraid to reach out – for these were skills we had yet to learn, the tender emotional lives of children being soft things that take time to scab over with the jaded guardedness of teen years and scarred into the coping mechanisms that keep adults from utterly destroying themselves, if they are lucky enough to find the strength to be open about their feelings and lucky enough to find acceptance when they do. Still, Mister Rogers loved us, regardless of the apartness we felt. Regardless of the way we looked, or the fact that we needed such unusual apparatuses to perform everyday tasks. Mister Rogers had told me – not just over the airwaves, but directly to my bruised little soul – that I was worthy of respect. That I, and others like me, should not be mocked, but loved. Treated with gentility and grace. 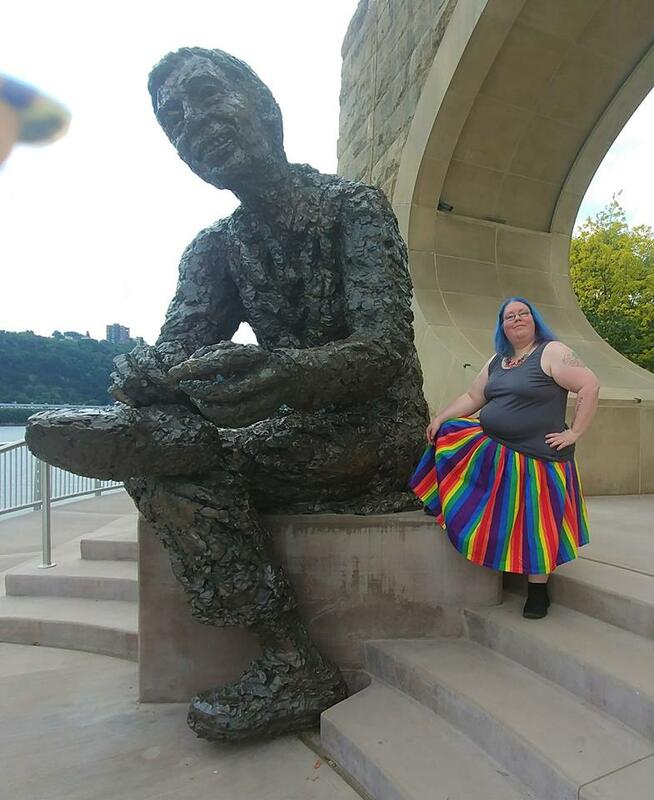 Mister Rogers became my hero that day, a bastion of acceptance and warmth whom I had not even realized I needed so badly. Years have passed since I saw Mister Rogers don those telescope lenses and heard him speak to my spirit. And throughout my adult life, I still find myself coming back to the comfort and wisdom of this man’s words and deeds. 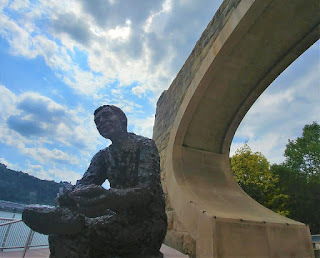 I have been fortunate enough to visit the statue that commemorates his memory on the North Shore in Pittsburgh, where he lived and worked, and I still find so much amazement in the beautiful things that I can still see. I may go completely blind someday – no one really fully understands the latent effects of Congenital Rubella Syndrome – but, even if I do, I will always hold dear the memories of the neighbor I had who lived nowhere near me as I was growing up. I will always remember the seriousness of his face when he spoke to those who would have spoken further cruel words to someone like me, begging them for pause and care in the ways they might treat someone different from them. I won’t forget the way he balked at the strangeness of wearing those glasses yet spoke of the ordinariness of the lives of those who wore them. Mister Fred Rogers reminded me of a very important truth that day, one I’ve carried with me since: I mattered, and I was fine just the way I was. I didn’t have to prove my worth, even if some people wanted me to feel like I was less than they were because of the way I looked, or the fact that my eyes didn’t work the way theirs did. And although there are things I’ll never really be able to do, and things I’ll always have to work twice as hard to accomplish as someone fully sighted might, I am a person deserving of simple human kindness. Decency. Dignity. And so is every single individual with whom I may cross paths in this life. We are all neighbors. And we all carry stories inside of us that hurt; some wear deeper scars and wield fiercer swords to hide them. But I believe that Mister Rogers’ most profound messages were centered on love. When we learn to reach into those darker recesses of our memories, and try to heal the wounds we are desperate to be rid of – regardless of their origins – when we really and truly learn to love even the parts of us that we fear are too ugly or too broken for mercy, we become a part of his clan. We become a part of Mister Rogers’ incredible legacy. And with it, we can find ways to reach out to our own neighbors, near and far, and we can change the world one person at a time – just as he tried to do while he was alive.